Bathrooms are one of the spaces in the home where we spend a large amount of time. Bathing, applying makeup, performing our morning and night rituals, all take place in the bathroom. For this reason, you want a bathroom that suits your needs and makes you feel relaxed and inspired. Here are some simple tips on taking the necessary steps to build a new bathroom in your home. Before you start any building project at all, you need to know that you have the finances to complete the job. You do not want any sticker shock when you begin working with your contractor and buying the parts for your bathroom. Look at some estimates for a similar job that you may want performed. Once you have some rough estimates, call around and ask for estimates from contractors in your particular area. The only way to know if the fixtures that you wish to place in the bathroom will fit is to measure out the space that will be used in the bathroom. Take the measurements for the width, length, and the height of the room. Also remember to make allowances for any extra space that you may be using or space that may be taken out. For instance, if you are knocking down the closet to extend the bathroom, measure this space as well. Your bathroom contractor is going to be the person who makes the magic happen. Finding a builder is the most important part of the entire task. 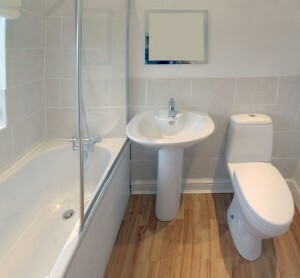 The quality of the builders work will determine if your bathroom will be a first rate model, or if the bathroom will have issues down the line. If you want the image that you have of your dream bathroom to be brought to life, hire a top rated builder. Before you start the process of tearing down walls or taking out any bathroom fixtures, you need to draw up blueprints for the bathroom. This process may actually be simpler than you think. A builder can produce sketches as well as blueprints. The blueprints can help you visualize, but are also used to mark out the spacing for the bathroom. Make sure that all of your pieces are slated to come in before they are needed in the building process. There is nothing worse than having construction held up because you don’t have parts that you need to put in. If you are going to change around the layout of the bathroom, remember that you will have to reconfigure the electrical plugs. You may need to bring in an electrician in order to install new plugs in the spots designated on your blueprints. Ask your builder if they have recommendations to make it easier to find a professional electrician. Do not get to the end of the process only to find that there is an issue that will require you to take apart the pieces of your newly built bathroom in order to fix the issue. Code issues are also a major problem as the construction cannot be completed properly if not up to code. Inspect the bathroom weekly or more to determine that everything is going up properly. Everyone should have a contract with the builder who is creating their new bathroom. A contract protects both parties as it clearly outlines the expectations from each side and the cost to perform the new build. Pay in accordance with the contract in order to keep the workers happy and on task. The last thing that you want is a construction project that has no particular end date. When you first meet with your builder about the bathroom and create the contract, ask for an estimated completion date. The completion date will be one of the days you are looking forward to, so ask for updates on the estimated date so that everyone is on the same page. Make sure that you are prepared to live in a construction zone for a few weeks while your bathroom gets done. Though the process of going through the actual building of the restroom may be difficult, the result of a perfectly customized bathroom is well worth the headache that construction can bring.